The Sahel region is the semi-arid transition zone, dominated by grasslands and acacia savanna, located between the Sahara desert and the tropical savanna. The Sahel stretches more than 5,000 km across Africa, from the Atlantic Ocean (Senegal, Mauritania) to the Red Sea (Sudan). The few months of rainy season in the Sahel are much needed in these hot and sunny parts of Africa and key factor for the food security and livelihood of the people. 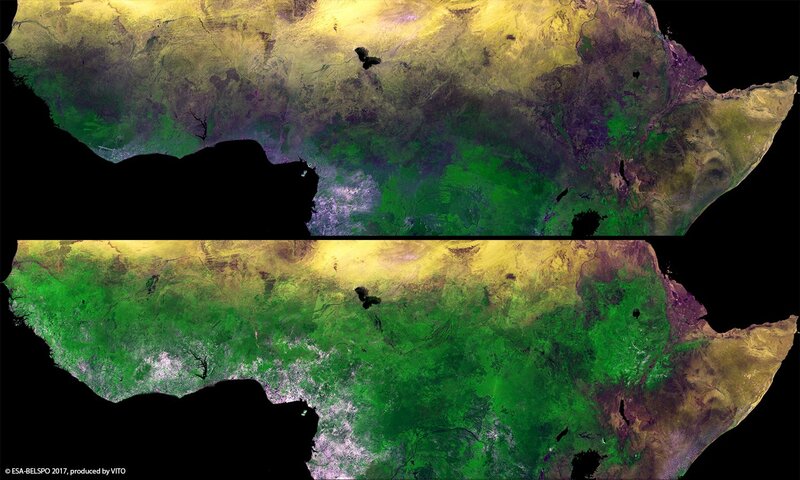 The name Sahel can be translated from Arabic as coast or shore, painting us the picture of the moving shoreline between vegetation and the desert along the year, as exemplified by this pair PROBA-V 300m images. They were captured in February(top), in the dry season, and September(bottom), towards the end of the Sahelian rains.